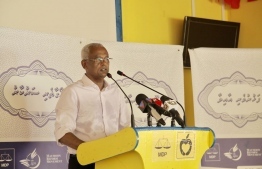 Opposition coalition leader, Ibrahim Mohamed Solih (Ibu), on Wednesday, stated that the order and development of the Maldives would be adrift if President Yameen is re-elected for another presidential term. Speaking to a large number of Maldivian Democratic Party (MDP) supporters at Veyvah, Laamu, on the campaign trail of the opposition coalition to Laamu and Thaa atoll, Ibu accused President Yameen and the current government of carrying out multiple unlawful acts. According to Ibu, one of the current government's most detrimental acts is the persuasion of government workers. He suggests that the workers of the current government do not have the freedom to support diverse parties and ideologies. Ibu claimed that in an MDP-led government, this freedom would be afforded to all. "Should President Yameen be elected for the coming five years, Maldives will go adrift. The injustice and the violence will be extended to the coming generations as well", states Ibu. Furthermore, Ibu equated the unjust ruling of the current government as being the reason behind the increase of the opposition coalition supporters in Maavah, Laamu. As well as throughout the Maldives. "I am well aware of the political state that previously existed on this island. The tone of the political supporters has now shifted immensely", said Ibu. Speaking at the campaign stop at Maavah, Ibu assured the successful completion of the island's water supply system as well as the island's harbour building project, should he win the upcoming election, vowing to further expand tourism opportunities within the atoll. As the people of Maavah frequently travel to the neighbouring islands of Fonadhoo and Gan, Ibu guaranteed more convenient transport facilities to the people of the island needing to make such trips regularly. Noting that the housing problem stemming from the lack of land issued to the people of Maavah had been stalled over the last 15 years, he pledged that unavailability of land would be addressed, expressing his intent to reclaim more land for the island population of 2,030 civilians.